To promote the latest, hot-n-happening Hot Wheels fantasy world from Mattel Toys, a floor standing unit based on an actual Hot Wheels car model design was created. These units were placed at all major toy retailing outlets for garnering high visibility and achieving the required sales as well. Mattel has been one of the leading toy manufacturing companies in India, catering to the kids segment. Their exclusive stores offer the best and novelty products for customers across the country. Mattel Toys has focused its efforts around the core philosophy of ‘Play with Purpose’ – where each toy developed by the global leader has an intrinsic benefit linked to it. Hot Wheels is one of the most exclusive brands from the Mattel stable. An array of car models have been introduced for different Hot Wheel types, hence the TG for these cars are parents as well as kids. To promote the latest, hot-n-happening Hot Wheels fantasy world of toys, a design strategy was devised. A floor standing unit based on an actual Hot Wheels car model design was created. 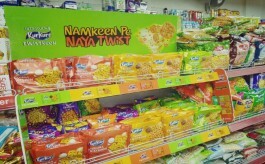 This was placed in a Modern Trade environment for garnering high visibility and achieving the required sales as well. Brandmark Solutions, Mumbai executed the design. The challenge before Brandmark was to create a vertical largerthan-life Hot Wheels car, maintaining and achieving the exact look that too sans any reference or an ED as per the enlarged proportions. Their design team achieved the proportionate car structure with the actual miniature car and pack shots to give an exact connect with the brand. The car structure was designed to make the larger-than-life model look exact with smooth and curvy protrusions and connected to the brand preposition. The production team transformed the same by using FRP material with high gloss paint towering exactly the miniature. 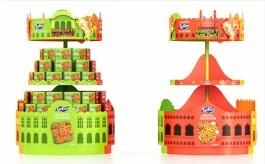 The FRP structure showcasing the top and both sides with branding, exactly resembled the miniature car model with front of the vertical car being utilised for product stacking with a slat wall and peghooks. Also, peghooks placed at an equidistance were customised to display the varied and multi-product range of Hot Wheels cars that had to be showcased on the FSU. Overall this display unit grabbed eyeballs deriving the desired results and fulfilling the purpose of its being at the category. These units were placed at all major toy retailing outlets like Hamleys and other MT outlets.